Before I get to today’s post, you may have noticed that the title of this food blog changed from “The Spamwise Chronicles” to “Simple Kitchen Seasons”. As I explain on my ‘About’ page, this blog began life as an LGBT blog that had posts about all sorts of things, such as U.S. Supreme Court cases, the travails of the second Bush administration and the 2008 American presidential election. There were, probably not as often as I would have liked, occasional posts about food. A couple of years later, I decided that I could probably do food blogging better than ruminating about politics, especially when other blogs that I frequent do it so well. I ripped the insides out and did a total 180-degree transformation, the result being the food blog you see today. However, the name didn’t change until now. I’m hoping that when new readers come across this blog — or if you already do follow it — that the new name is more appealing than the old one. Sometimes, you can’t make an omelette without breaking some eggs. This is the story of Simple Kitchen Seasons, a food blog devoted to the beauty of food, cooking seasonally and eating well. 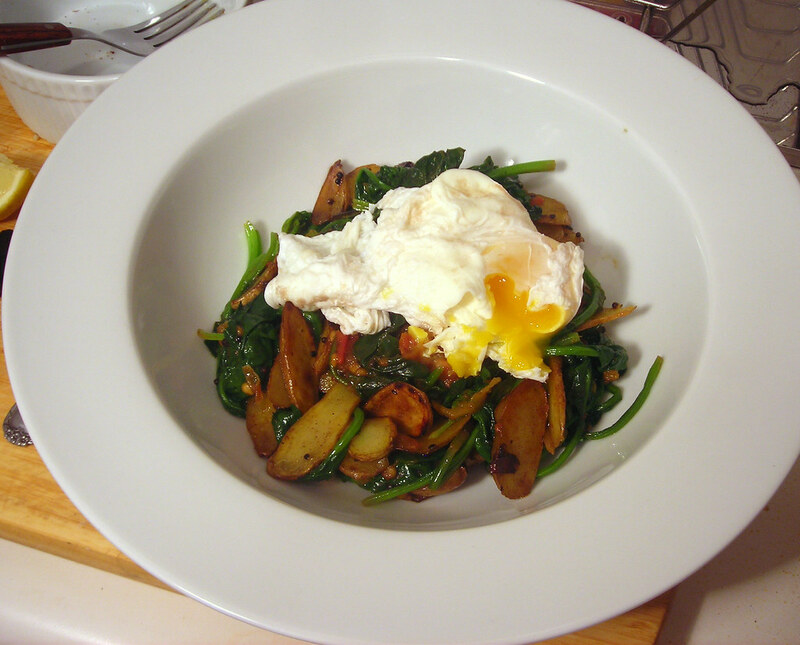 The vast majority of recipes that you’ll find on this blog are simple, uncomplicated dishes that anyone can make. I hope you enjoy your stay. 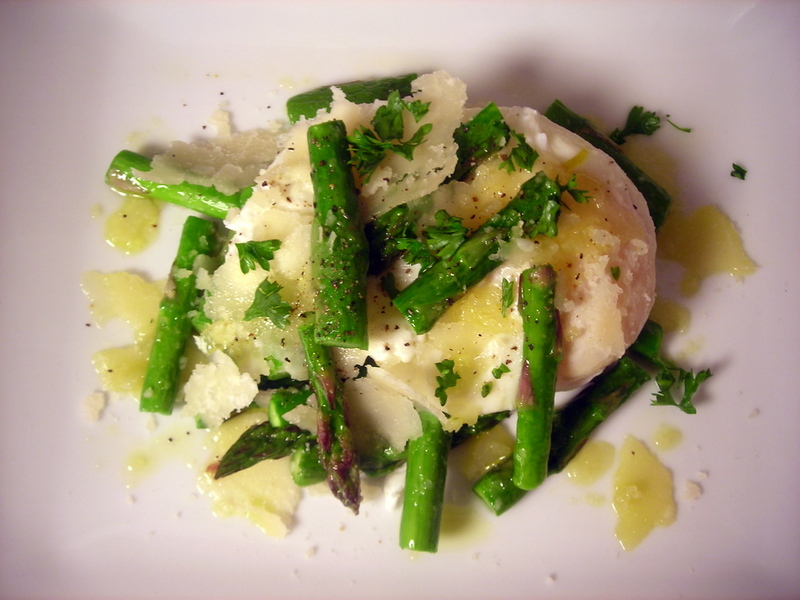 Place asparagus in a small bowl. Lightly drizzle with two tablespoons olive oil and add a small pinch of salt. Season lightly with black pepper. Toss to ensure that the spears are well-coated. Transfer to a Pyrex baking dish or roasting pan and roast at 350 F for 5 minutes. Remove from the oven and set aside. Melt butter in a 3-quart sauté pan over medium heat. Add almonds and cook, stirring, until light golden. Remove from heat and transfer almonds to a plate or bowl; set aside for garnish. Meanwhile, bring a pot of water to a roiling boil. 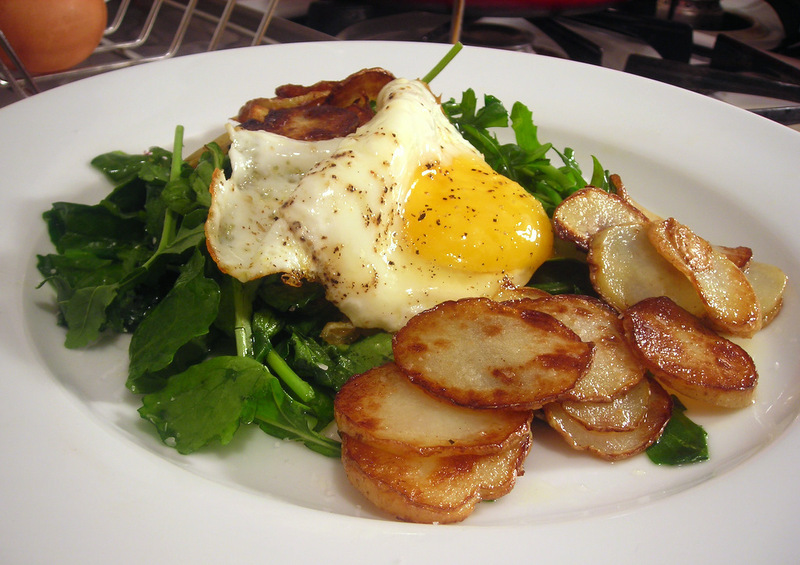 Add egg and cook, about 3 to 5 minutes; cooking time will vary and is dependent on the freshness of the egg. Let cool, then peel and slice in half. To plate — Lay asparagus spears attractively on a serving plate. Top with almonds. 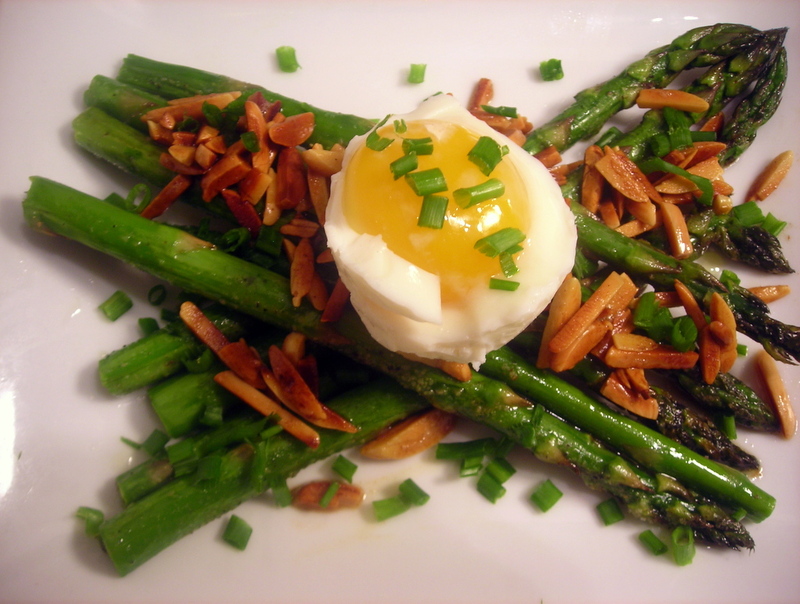 Nestle the soft-cooked egg atop the asparagus spears. Sprinkle with chives, then serve at once. Time: About 30 minutes, including prep. This is a liberal time estimate, in case some people are ‘kitchen-challenged’. This is my contribution to Weekend Herb Blogging #335, which is currently hosted by Simona of Briciole and organized by Haalo of Cook (almost) Anything at Least Once. Weekend Herb Blogging is a weekly foodblogging event that was originally begun by Kalyn of Kalyn’s Kitchen. 25 May	This entry was published on May 25, 2012 at 11:45 pm. It’s filed under cooking, food, food photography, Gluten-Free, recipe, spring, vegetarian, Weekend Herb Blogging and tagged appetizer, asparagus, eggs, food photography, gluten-free, vegetarian. Bookmark the permalink. Follow any comments here with the RSS feed for this post. Egg lovers unite! How’s that for a rallying cry? I like the new name. I have never had wild turkey eggs: interesting. 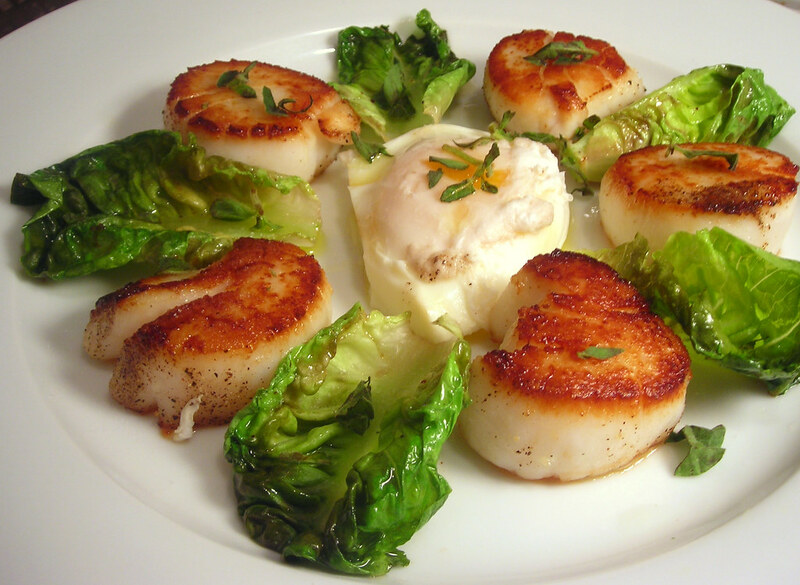 Very nice dish: thank you for contributing to WHB! They have a somewhat “gamy” flavor, slightly more intense than chicken eggs. There’s an inner ‘lining’ between the shell and the egg white, which makes removing them from the shell a delicate endeavor, particularly if the egg is soft-cooked. That’s why in the picture, it looks a little “ravaged”. Thank you, Simona. The banner will change once I have a sufficient stock of photos I feel comfortable with.